The picture shows Lady Captain of Oughterard Golf Club, Mary McInerney, Minister of State Michael Ring, Captain of Oughterard Golf, Pierce O'Malley and President of Oughterard Golf, Tim Hernon. 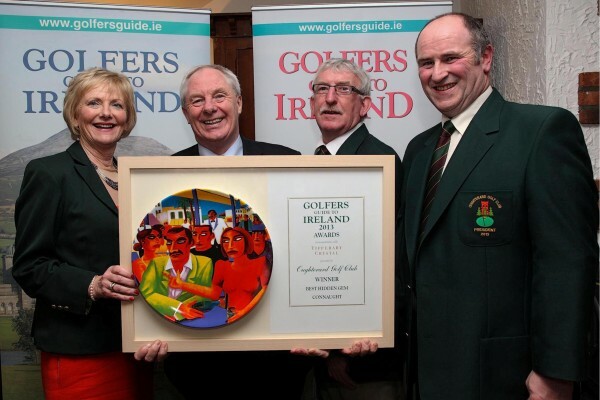 This is the third year of the competition and acknowledgment is accorded to the Golfer’s Guide to Ireland for its promotion of golf in Ireland since 1992. The award to Oughterard Golf Club reflects the Trojan work which has been invested by staff and committees over the past years. It is clear that an award such as this is based on the merits of the continued commitment of all involved. We want to take this opportunity to acknowledge this on-going commitment and investment and pay tribute to all staff and volunteers. Minister of State Michael Ring presented the awards to all winners in a celebration held in O’Connells, Donnybrook, Dublin on January 15 2013. Accepting the award on behalf of Oughterard Golf Club, Captain Pierce, Lady Captain Mary and President Tim expressed their delight on the achievement.